About thrity species of Atriplex are recorded in Britain. These include the native species Babington's Orache (A. glabriuscula), Frosted Orache (A. laciniata), Grass-leaved Orache (A. littoralis), Long-stalked Orache (A. longipes), Common Orache (A. patula), Pedunculate or Stalked Sea-purslane (A. pedunculata), Sea-purslane (A. portulacoides), Early Orache (A. praecox) and Spear-leaved Orache (A. prostrata). The BSBI provide a downloadable plant crib for Atriplex. Pedunculate or Stalked Sea-purslane (A. pedunculata) is protected under Schedule 8 of the Wildlife and Countryside Act, 1981. Seventeen British miners are recorded on Atriplex. 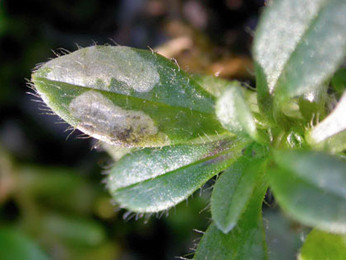 The agromyzid Liriomyza huidobrensis, a pest species of ornamental and vegetable crops occasionally intercepted at UK points of entry, has been recorded on Atriplex and has been found under glass in England and Wales. All populations have been and continue to be eradicated. See also Liriomyza species in Glasshouses and/or Quarantine Interceptions. The British agromyzid Amauromyza luteiceps is recorded as a stem-borer of Atriplex, although this host record is not based on British specimens. Three species, Coleophora atriplicis, Coleophora salinella and Coleophora saxicolella, are recorded as seed-feeders on Atriplex. A key to the European miners recorded on Atriplex is provided in Bladmineerders van Europa. 1a > Leaf and stem miner: Apart from mining leaves the stems are excavated. Oviposition takes place on the tips of shoots. The larva at first mines strip-like full depth corridors in the apical leaves, going then into the stem, which it hollows out, so that it becomes translucent. It then searches out leaves further down in which initially it mines depositing frass in strips, but then in blotches. The corridors often lie in one half of the leaf and can be branched. In the blotches the frass is irregularly scattered. Pupation is in the hollow stem or in the ground. On ? Agrostemma, ? Arenaria, Cerastium, ? Dianthus, ? Gypsophila, ? Lychnis, ? Saponaria, Silene, ? Spergularia, ? Stellaria and Vaccaria [Caryophyllaceae], Atriplex, ? Chenopodium, Spinacia [Chenopodiaceae], Phlox [Polemoniaceae] in Britain. Also recorded on other hosts elsewhere. Known only from Warwick and West Ross in Britain, Europe, Japan, Canada and Alaska. 2a > Leaf-miner: A distinctive mine primarily above mid-rib, with irregular short lateral offshoots into leaf blade. Pupation external (Spencer, 1972: 51 (fig. 172), 55; Spencer, 1976: 270, 271 (fig. 486)). Polyphagous. On more than 40 host genera in 15 families, but not yet on Atriplex, in Britain,. Widespread throughout Britain. Also recorded in the Republic of Ireland. Widespread in continental Europe. 2b > Leaf-miner: A white linear-blotch mine, the linear section sometimes not detectable as it becomes enveloped in later blotch (Spencer, 1976: 162-3, figs 296-7). A common miner, forming a white linear blotch mine (the blotch may obscure the linear portion of the mine) in both native and garden plants (British leafminers).The mine is also illustrated in the Encyclopedia of Life. On numerous genera of Caryophyllaceae and Chenopodiaceae, including Atriplex, in Britain. Widespread but local in Britain. Widespread and not uncommon in much of Europe. Also recorded in Canada. 2c > Leaf-miner: Blotch mines, generally occupying an entire leaf, usually containing several larvae. Much, half deliquescent, green frass (Bladmineerders van Europa). Mine indistinguishable from P. exilis or P. hyoscyami (Bladmineerders van Europa). On Atriplex, Beta and ? Polygonum, but not yet on Solanum, in Britain and additionally Silene and Spinacia [Caryophyllaceae], Chenopodium, Atropa, Hyoscyamus and Solanum [Solanaceae] in continental Europe. Only recorded from Warwick in Britain. Also recorded in the Republic of Ireland, Europe, the East Palaearctic and Nearctic Regions. Widespread in continental Europe including Balearic Is., Canary Is., Czech Republic, Danish mainland, Finland, Greek mainland, Hungary, Italian mainland, Malta, Norwegian mainland, Russia (Central), Sweden, East Palaearctic, Near East, North Africa (Michelsen in Fauna Europaea). Pegomya betae (Curtis, 1847) [Diptera: Anthomyiidae]. 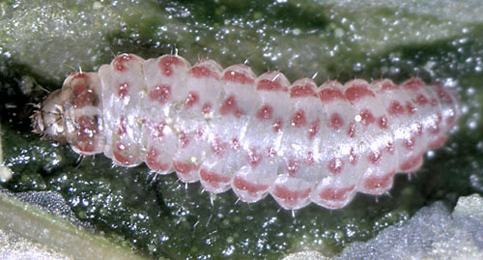 2d > Leaf-miner: The larva makes several full depth blotch mines (Bladmineerders van Europa). Hosts in Britain unknown. On Atriplex, Beta, Chenopodium and Spinacia elsewhere. Pegomya cunicularia (Rondani, 1866) [Diptera: Anthomyiidae]. 2e > Leaf-miner: Large blotch mine, often with several larvae, beginning with a short deeper corridor at a single egg shell on the surface of the leaf. The broad deep corridor later ends in a blotch but can be recognised (beneath the blotch) by its greater depth. Mine predominantly dorsal or ventral, greenish in transmitted light. Frass grains irregularly scattered except in the initial corridor. Blotch, mostly occupying almos the entire leaf, containing several larvae. Much, half-deliquescent, greenish-black frass. At the start of the mine at the leaf underside a group of some 5 elliptic egg shells, parallel to each other. However, the larvae can leave their mine and restart elsewhere, so mines without egg shells can occur as well. The larvae do not penetrate into the stem of the plant, neither is the mine full depth (compare Delia species) (Bladmineerders van Europa). Mine indistinguishable from P. exilis or P. hyoscyami (Bladmineerders van Europa). 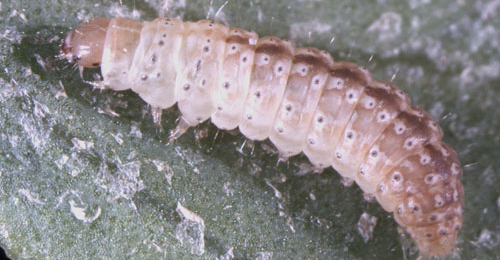 Makes a large upper surface whitish blotch, which can contain several larvae. The frass has a washed out appearance and is greenish. There may be several mines on a leaf and eventually the leaf will be mined and then shrivel up. To identify this miner adults must be reared (British leafminers). On Silene, Atriplex, Beta, Chenopodium and ? Solanum in Britain and additional genera of Chenopodiaceae and Solanaceae elsewhere. Known only from Inner Hebrides, Ayr and Warwick in Britain. Also recorded in continental Europe and the East Palaearctic. Pegomya hyoscyami (Panzer, 1809) [Diptera: Anthomyiidae]. 2f > Leaf-miner: Blotch (Bladmineerders van Europa). Botanophila depressa (Stein, 1907) [Diptera: Anthomyiidae]. 2g > Leaf-miner: The mine starts as a long, narrow, winding corridor running towards the midrib, widening to a blotch. Usually upper-surface, but in small leaves also full-depth parts may occur. The blotch has broad lobes; in their ends most frass is accumulated in the form of green patches or clouds. Sometimes several larvae share mine. Pupation usually in the soil, less often in the leaf (and then generally not in the mine itself but in a small separated mine, that may even be made in the petiole) (Bladmineerders van Europa). 2h > Leaf-miner: A short, irregular, linear upper surface mine on any part of the leaf. Also recorded from young pods (Bland, 1997a). Polyphagous. On 119 plant genera in 31 plant families of which only 4 plant genera in 2 plant families, but not yet on Atriplex, in Britain. Local, probably introduced to Britain. Widespread in continental Europe particularly in Botanical Gardens and glasshouses. Also recorded in Egypt. 2i > Leaf-miner: Broad mine of variable depth. Frass spread irregularly. Pupation usually internal, seldom external (Bladmineerders van Europa). On ? Atriplex, ? Beta, ? Salicornia, ? Spergularia and ? Sueada in Britain plus Obione elsewhere. Recorded in Britain and the the Republic of Ireland (Zatwarnicki, 2004 in Fauna Europaea). Widespread in continental Europe. Clanoneurum cimiciforme (Haliday, 1855) [Diptera: Ephydridae]. On Atriplex and Chenopodium in Britain plus Amaranthus and Monolepis elsewhere. Widespread in Britain and continental Europe. On Atriplex and Chenopodium in Britain plus Amaranthus, Bassia and Spinacia elsewhere. Widespread in Britain and continental Europe. Polyphagous. On numerous genera and species of plant families, but not yet on Atriplex, in Britain. On numerous genera and species of plant families including Atriplex elsewhere. Widespread in Britain and continental Europe. Also recorded from the Channel Is. 1d > Leaf-miner: Young larvae make irregular corridor-like or blotch-like mines from a silken tube. The mines contain almost no frass (Bladmineerders van Europa). On Atriplex and Chenopodium in Britain and elsewhere. Widespread in Britain and continental Europe. Also recorded in the Republic of Ireland. Scrobipalpa atriplicella (Fischer von Röslerstamm, 1841) [Lepidoptera: Gelechiidae]. 1e > Leaf-miner: Larvae in blotch-like mines. Most frass is ejected through a small opening in the mine. Fresh mines are very difficult to find. The larvae can leave their mine and restart elsewhere. Pupation external (Bladmineerders van Europa in a mud-covered cocoon on the ground (British leafminers). On ? Aster tripolium, Atriplex portulacoides, ? Salicornia europaea, ? Plantago coronopus in Britain and Atriplex portulacoides and Atriplex halimus elsewhere. Found around the coasts of England. Also recorded in the Republic of Ireland. Widespread in continental Europe. Scrobipalpa instabilella (Douglas, 1846) [Lepidoptera: Gelechiidae]. 1f > Leaf-miner: The first instar larva tends to make a U-shaped mine, whereas later larvae make irregular mines. Final instar larvae spin the leaves together and feed in a silken tube amongst the seeds (British leafminers). Young larvae make a short, spiralled corridor typically U-shaped). This stage is followed by an irregular, sometimes branching, greenish-white blotch. In their final stage the larva lives free in a silken tunnel among the leaves (Bladmineerders van Europa). Pupation in a cocoon of sand grains and detritus (British leafminers). On Cakile, Atriplex, Beta, Chenopodium, Salicornia, Sarcocornia and Suaeda in Britain.and Atriplex, Beta, Chenopodium, Salicornia and Suaeda elsewhere. One of the commonest gelechid moths on saltings in the British Isles. Also recorded in the Republic of Ireland. Widespread in continental Europe. Scrobipalpa nitentella (Fuchs, 1902) [Lepidoptera: Gelechiidae]. 1g > Leaf-miner: Young larvae bore in the midrib, later they mine the leaf from a web spun over of the leaf (Bladmineerders van Europa). On Beta vulgaris ssp. maritima in Britain and ? Atriplex, Beta, ? Salicornia and ? Suaeda elsewhere. Widespread in southern England. Also recorded in the Republic of Ireland. Widespread in continental Europe.
? Scrobipalpa ocellatella (Boyd, 1858) [Lepidoptera: Gelechiidae].